All week long I've been fighting with nausea and soreness, missing a few days of work because of it. Dad called mid week and said he was heading south to a lake where the fishing is usually good in the early spring, and asked if I wanted to come down Saturday. I wanted to, but an early morning, a long drive and more time on my feet than I'd had all week just didn't seem to fit with how I was feeling. The fishing was epic by all reports. Ran back home to switch out the rod and stopped to get Deli a drink on the way. As we came out of the little restaurant the guy that had been fishing the stream passed us. With the drink delivered and a new rod in hand, we headed back to the stream to see if any fish wanted to play. 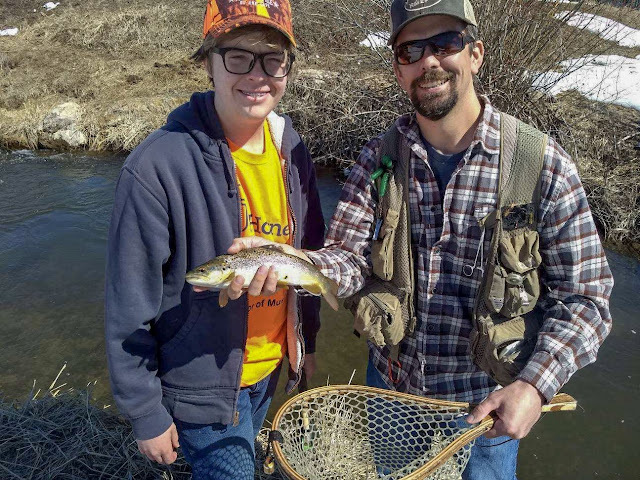 Atley was up first and did a great job nabbing the first fish on a prince nymph. We tried to get Caden a fish, but they were being just difficult enough that he couldn't make it happen. We moved upstream, working the spots we could reach from the shore since none of us had waders on (in fact, I need to buy some new ones...) The last spot that we fished before we all agreed on heading home was a deep pool where we usually can trick a trout or two. 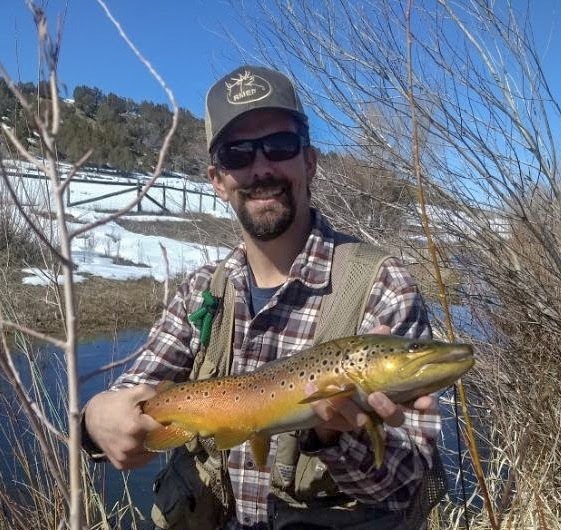 Luck was with us as I hooked and landed a beautiful brown. Any day I can get out and fish with my boys is a good one! Yep, I'd call that a nice Brown. Maybe next time for Caden. Time on the water cures what ails ya. Even when you don't catch a fish. :) Time well spent either way.